R.A.F. 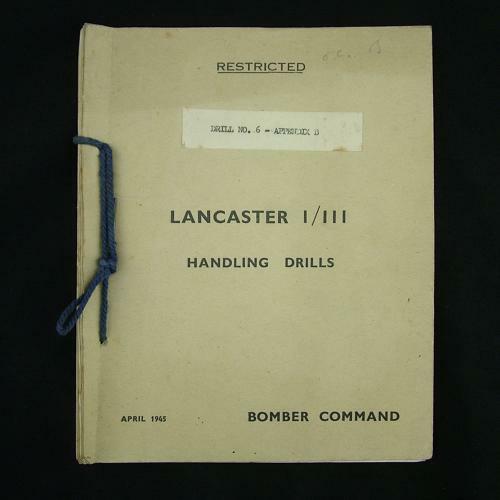 Bomber Command Lancaster I/III Handling Drills - Drill No.6 - Appendix B. P/b, 16.5 x 20cm, 26p, April 1945. Marked as "Restricted'. Detailed information of tasks to be carried out by the crew from dispersal throught to flight. It begins with external checks to be made by the pilot and flight engineer from chocks under the wheels, tyre checks, oil leaks etc. Also covered are start-up drills, intercomm checks, running up drill, taxying drill, take-off drill, landing drills, mislanding drills, stoping engines, feathering drill, three and two engine flying, engine fire drills and so on. Very comprehensive. Light soiling on the covers but in very good overall condition. Stock code P22195.